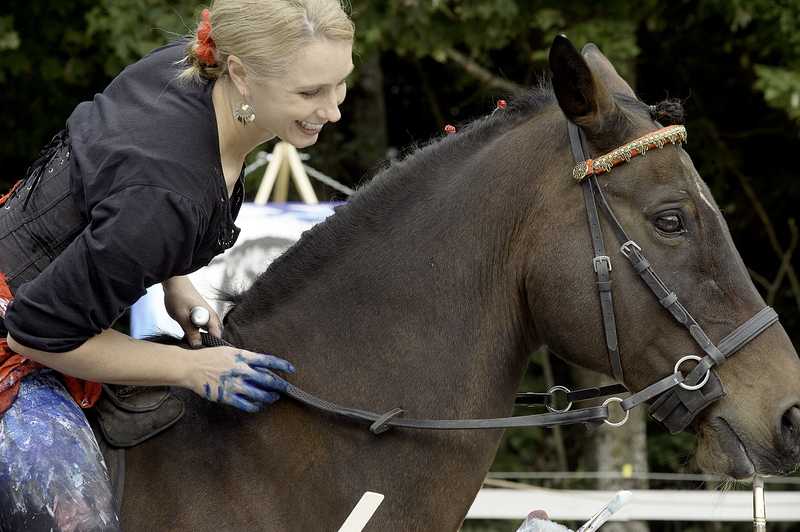 Sandra Beaulieu of Dover-Foxcroft rides Rovandio while leading a demonstration called “Art on Horseback: Painting While Riding with Your Equine Partner” during the Horse Professional Demonstration Expo at the Healing Through Horses facility in New Gloucester on Saturday. 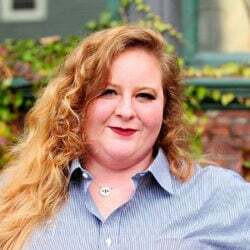 Beaulieu said she has been involved in art and riding since she was a child. 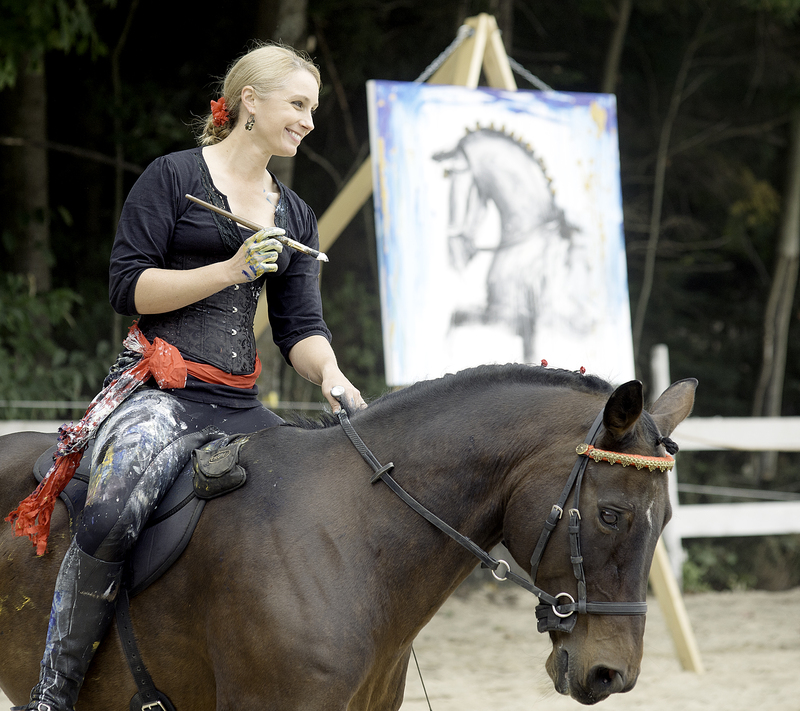 So after 20 years, she decided to combine her two passions and paint while riding her horse. Beaulieu’s demonstration was one of 20 offered from a variety of experts who donated their time to raise money for the center whose mission is to help people through therapy with horses. 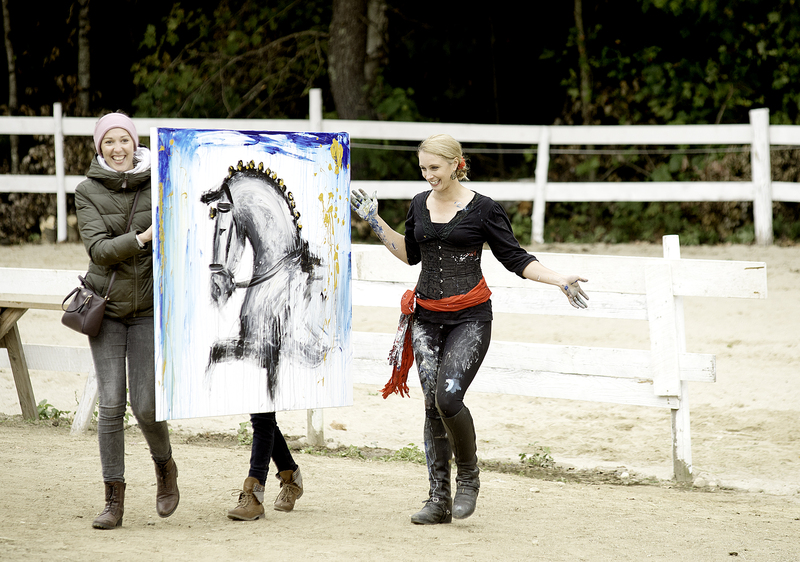 Sarah Kaech, left, Taylor Burdin, behind the painting, and Sandra Beaulieu carry the painting that Beaulieu created while riding her horse during the Horse Professional Demonstration Expo at the Healing Through Horses facility in New Gloucester on Saturday. The acrylic painting will be at the facility and bids will be accepted through November. Money raised will benefit the center whose mission is to help people through therapy with horses. Rovandio grabs a paintbrush with his mouth as Sandra Beaulieu rides past the table where her paint and brushes are.